The Ecstatic Birth Training Series includes two modules: The Foundation Series which lays the foundation for Ecstatic Birth preparation and support and The Body Series which focuses on living in your body, accessing the power, pleasure, and wisdom from within, and how to integrate that in childbirth! 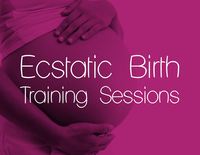 This is an unprecedented opportunity to learn about Ecstatic Birth straight from the experts in the field. Included are 20 audio interviews (and transcripts) moderated by Sheila Kamara Hay and featuring Dr. Christiane Northrup, Ina May Gaskin, Mama Gena, and many other leaders in the worlds of childbirth and female health and sensuality. If you are a prenatal or birth practitioner, click here to order your copy, and be connected to an online community of Ecstatic Birth practitioners..